Low home prices and mortgage rates have combined to push home affordability to record levels nationwide. Home buyers are taking advantage. The Pending Home Sales Index rose 7 percent in November to rise to its highest level since April 2010, the last month of last year’s home buyer tax credit program. 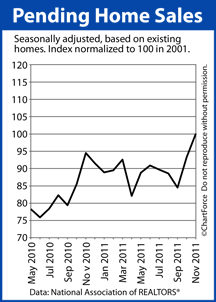 The Pending Home Sales Index is published monthly by the National Association of REALTORS®. It measures homes under contract nationwide, but not yet “sold”. In this way, the Pending Home Sales Index is different from other housing market indicators. It’s a “forward-looking” figure; a predictor of future home sales. According to the National Association of REALTORS®, more than 80% of homes under contract close within 60 days. By contrast, housing data such as the Existing Home Sales report and the New Home Sales report “look back”. November marks the second straight month of Pending Home Sales Index improvement. 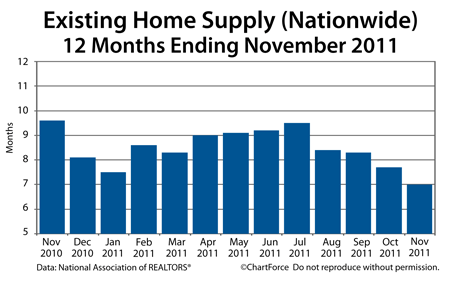 The housing market metric made big gains of 10 percent in October 2011, as well. On a regional basis, each part of the country showed an increase in homes under contract. However, here in Westchester, we must discount the value of even the regional data, somewhat. Like else in real estate, the volume of homes going under contract vary by locality. Throughout the West Region, for example, the region in which pending home sales increased the most from October, there are nearly a dozen states. Undoubtedly, some of those states performed better than others in terms of “homes under contract”, but we don’t have an indication of which states those were. In addition, within each state, every city, town, and neighborhood realized its own unique market in November, and produced its own sales statistics. For buyers and sellers throughout New York and the country, therefore, it’s more important to watch data on a local level than on a national one. Reports like the Pending Home Sales Index are helpful in showing national trends, but as an individual, what you need are local trends. For local real estate data, be sure to ask your agent. The government confirms what the private-sector Case-Shiller Index reported yesterday. 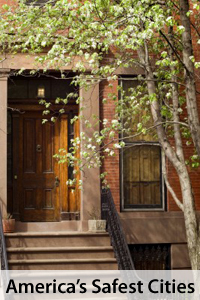 Nationwide, average home values slipped in October. The Federal Home Finance Agency’s Home Price Index shows home values down 0.2% on a monthly, seasonally-adjusted basis. October marks just the second time since April that home values fell month-over-month. The Case-Shiller Index 20-City Composite showed values down 0.7 percent from September to October. As a home buyer in Westchester , it’s easy to look at these numbers and think housing markets are down. Ultimately, that may prove true. However, before we take the FHFA’s October Home Price Index at face value, we have to consider the report’s flaws. There are three of them — and they’re glaring. As we address them, it becomes clear that the Home Price Index — like the Case-Shiller Index — is of little use to everyday buyers and sellers in places like Long island. First, the FHFA Home Price Index only tracks home values for homes backed by Fannie Mae or Freddie Mac mortgages. This means that homes backed by the FHA, for example, are specifically not computed in the monthly Home Price Index. In 2007, this was not as big of an issue as it is today. in 2007, the FHA insured just 4 percent of the housing market. Today, the FHA is estimated to have more than one-third of the overall housing market. This means that one-third of all home sales are excluded from the HPI — a huge exclusion. Second, the FHFA Home Price Index excludes new home sales and cash purchases, accounting for home resales backed by mortgages only. New home sales is a growing part of the market, and cash sales topped 29 percent in October 2011. Third, the Home Price Index is on a 60-day delay. The above report is for homes that closed in October. It’s nearly January now. Market momentum is different now. Existing Home Sales and New Home Sales have been rising; homebuilder confidence is up; Housing Starts are showing strength. In addition, the Pending Home Sales Index points to a strong year-end. The Home Price Index doesn’t capture this news. It’s reporting on expired market conditions instead. For local, up-to-the-minute housing market data, skip past the national data. 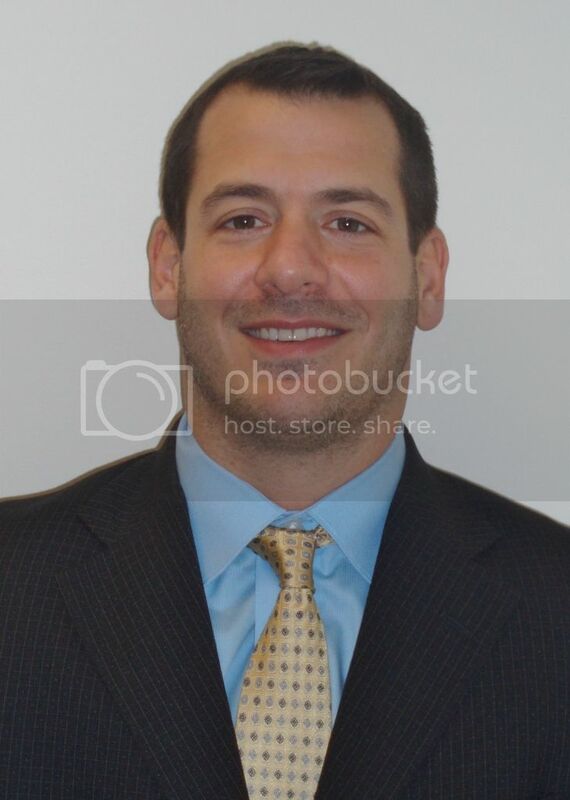 You’ll get better, more relevant facts from a local real estate agent. 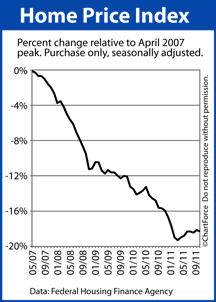 Since peaking in April 2007, the FHFA’s Home Price Index is off 18.3 percent. It’s an unsettling series of developments for today’s Westchester home buyers. As home supplies drop and builders gain confidence, the ability of an buyer to negotiate for price reduction and/or upgrades shrinks. Looking for safe cities in which to live? A recent study may help you. Titled “America’s Safest Cities“, Forbes Magazine compiled data from more than 70 cities with populations of 250,000 or more, and ranked them by violent crime rate as reported by the Federal Bureau of Investigation. A “violent crime” is one that can be categorized as murder, robbery, and assault, among others. Then, for each metropolis, local traffic-fatality rates were added to the area’s violent crime rate, and averaged into the data. Forbes is quick to note that “gridlocked” traffic patterns help keep cities safe; which may explain why cities like Honolulu and New York City made the Top 10. When cars are forced to move more slowly, the report states, traffic-related fatalities tend to plummet. Don’t rush to make a home-buying decision based on Forbes data alone, however. Like everything else in real estate, data is local and city-wide statistics are too broad to be helpful to an everyday buyer in Bronx. For accurate, real-time, local crime data, be sure to ask a real estate profession. Time is running out to boost to your 2011 federal tax refund. All you have to do is make your January 2012 mortgage payment while it’s still December. It’s a simple tax strategy that works because of how mortgage interest is paid, and of how the U.S. tax code is written. This is called “paying interest in arrears” and U.S. tax code states that the mortgage interest is tax-deductible in its year paid, subject to limitations. By making the January 2012 mortgage payment in December 2011, therefore, homeowners who itemize their on their tax returns can apply their January mortgage payment’s interest portion to their 2011’s tax returns. The alternative is to pay the mortgage on schedule, and wait for April 15, 2013 to claim the credit. If you choose to pre-pay your mortgage and typically send your payment via USPS, give your check ample time to be delivered to your lender, and processed. Mail your check no later than Saturday, December 24. For Westchester homeowners that pay electronically, the process is simpler. Edit your online bill pay program to have your mortgage payment post no later than Thursday, December 29. Make note, however. Not all mortgage interest is eligible for tax-deductibility, and not all homeowners throughout the state of New Jersey who pay mortgage interest should itemize said interest on their tax returns. Before prepaying on your mortgage, ask your tax professional for advice. Home resales moved to a 10-month high in November, the latest in a series of strong showings from the housing sector. According to the National Association of REALTORS®, November’s Existing Home Sales rose to a seasonally-adjusted, annualized 4.42 million units nationwide — a 4 percent climb from October 2011. An “existing home” is a home that has been previously occupied and cannot be categorized as new construction. Home buyers and sellers throughout Bronx should take note of November’s numbers because — behind the headlines — there’s a series of statistics that foretell higher home prices ahead. First, the total number of homes for sale nationwide dipped to 2.58 million, an 18% reduction from November 2010 and represents the fewest number of homes for sale since February 2007. 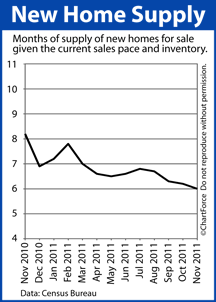 At the current sales pace, the complete home resale inventory would be sold in 7.0 months. And, second, the real estate trade group reports that 33% of all homes under contract “failed” for some reason last month. Contract failures can occur because of mortgage denials in underwriting; home inspection issues; and homes appraising for less than their respective purchase prices. In other words, despite a reduction in the number of homes for sale, and a rash of failed contracts, Existing Home Sales volume is still on the rise. Given high demand for home resales and shrinking home supplies, we should expect that Long island home prices will rise through December 2011 and into early-2012, at least. Recent Housing Starts data supports this notion. Thankfully, mortgage rates remain low. Low mortgage rates help keep homes affordable. The new construction housing market continues to show strength across the country. According to the U.S. Census Bureau, Single-Family Housing Starts rose to 447,000 units on a seasonally-adjusted, annualized basis in November — a 2 percent increase from October. A “Housing Start” is defined as breaking ground on new home construction. November’s figures mark the third straight month of Single-Family Housing Starts gains. The new construction metric is now 15 percent above its all-time low, set in February of this year. None of this should be a surprise to new home buyers in Bronx. Housing data has been trending better since September with sales volumes rising and home inventories falling. Basic economics tells us that home prices should soon rise. The good news is that low mortgage rates should keep homes affordable. Since mid-November, the average, conventional 30-year fixed rate mortgage has hovered near 4.000% nationwide with an accompanying 0.7 discount points plus closing costs. 1 discount point equals one percent of your loan size. This is down from near 4.500% six months ago, and the drop has made a big impact on home affordability. This represents $700 in savings per year. It’s no wonder home builders report the highest buyer foot traffic in 3 years. Meanwhile, the market shows little signs of slowing down. Building Permits are on the rise, too. Permits for single-family homes rose to their highest levels of year in November and 89 percent of those homes will start construction within 60 days. This means that Single-Family Housing Starts should stay strong through the early part of 2012, and into the spring. If you’re planning to buy new construction in New York , therefore, talk to your real estate agent soon and consider moving up your time frame. With mortgage rates low and next year’s buying season approaching, you may find that the best “deals” will come within the next few weeks only.